HyperSelect T8 LED 4FT Tube Lights offer a higher standard in commercial lighting. These frosted LED tube lights are compatible with T8, T10 and T12 fixtures and come with free LED non-shunted tombstones, making it easy to retrofit and direct wire the tubes with a ballast bypass installation. At Hyperikon, meeting our customers’ needs is our primary goal. This is what led us to develop the budget-friendly HyperSelect series of products. These products are designed to provide you with cost-conscious LED lighting without compromising on quality. We hope you’ll find that by purchasing HyperSelect LED products, you’ll have reliable, effective lighting for years to come. ✔ INSTANT COST-SAVINGS - Reduce your energy usage by switching to cost-conscious HyperSelect LED tubes. Save up to 55% on your electricity bill with 18W LED tube lights as 40W fluorescent replacements. ✔ LONG LASTING - HyperSelect glass LED tubes have an outstanding life rating of 45,000+ hours! These tubes can last 20+ years depending on use, eliminating the need to frequently replace your lighting. ✔ BRIGHT, HIGH OUTPUT LED - Illuminate your space with 2400 lumens! With super bright, high output LED tubes in your garage, warehouse, or office, you will see things in a new light. ✔ SIMPLE BALLAST BYPASS - These 4ft LED shop lights are single-end powered and require a simple, energy-saving ballast bypass (direct wire) installation. They are compatible with existing T8, T10, and T12 fluorescent fixtures. 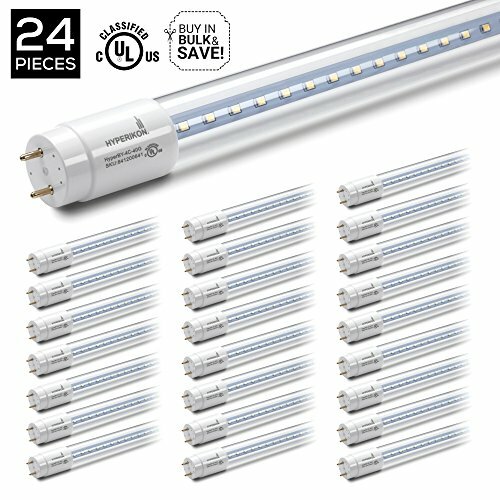 ✔ BEST-IN CLASS-WARRANTY - Hyperikon's hassle-free UNLIMITED 5 Year Warranty is unrivaled in the commercial lighting industry and covers all of our HyperSelect T8 LED tubes no matter what. Contact our customer service team 24/7!